Although an extremely effective cleaning agent for your heating system, over time your Magnaclean product will begin to fill up with all of the debris that it stops filling your pipes. Therefore, it requires servicing – annually at least – to make sure that it stays at the same level of efficiency that it was running at when you first picked up the product. While the benefits that it brings to the table are vast, a lack of cleaning and servicing for your Magnaclean fitting will do as much damage as not fitting it in the first place. If you are struggling to get the cleaning process down, then follow our simple instructions guide or contact us if you need more information on how we can assist you further, or carry out the cleaning process for you. However, the process itself is rather simple to follow once you do it once. 1. Before you get started, it’s very important that you make sure you turn off the electrical supply to the boiler. Additionally, shut off all isolation valves and loosen the air vent to release any pressure inside. When you start the venting process, protect your Magnaclean canister with some dustsheets or a container to capture any drips of water that may come out. 2. Your Magnaclean device should have come with a lid spanner – use this to unscrew the lid slowly, to make sure that you don’t do any damage to the canister. Take out all of the pressure in the lid until you can turn it with your hands. And take off the lid of the canister. Lift out the lid and you should see a rather incredible/grotesque build-up of sludge all over the middle section that comes out with the lid. 3. Remove the magnet from the filter, once this is removed clean off the build up of sludge, an high pressure hose is ideal for this process, if you do hot have access to one of these then a scrubbing brush and garden hose should do the trick. 4. Get a spray bottle, fill it with water, and get an old bucket that you can spray over. Start to spray the gunge off of your lid and keep going until it’s more or less spotless. 5. Now, you want to start to re-assemble the product. Place the lid back over the top of the canister, and insert it down. Twist with your hands until you feel it locking into place and that it will no longer turn much more. Get your lid spanner and tighten it further until it’s absolutely 100% sealed. Tighten up everything again and make sure that your Magnaclean is secure and safe. 6. 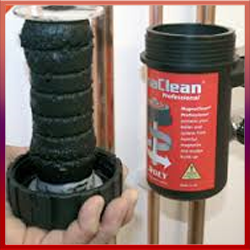 Do a test run of your system and make sure that your Magnaclean is doing its job without any problems or hassles. There you ave it! This is simple to do and can be incredibly easy if you do it even just once – it’s very quick to clean and there’s no real technical knowledge or tools needed. The longest part of the job is easily cleaning down the spout of the lid, but this is more time consuming than difficult. If you do have any problems cleaning or re-assembling your Magnaclean device, then contact us today and we can provide you with all the advice and assistance that you need.